You just got a clean kill – now the real work begins. With a supportive external frame and removable pack, the Rail Hauler 2500 can comfortably carry the heaviest loads. The Rail Hauler’s lightweight aluminum frame is designed to handle up to 200 pounds, giving you the perfect platform for hauling anything from overnight gear to an elk quarter. Wrap-around ‘wings’ combine with a vertical strap system to securely hold your load in place, while a folding shelf on the bottom supports the weight. This fall, I put the Slumberjack Rail Hauler 2500 to the test – on both a Coues whitetail and a late season bull elk hunt. After a couple months in the field, covering several miles and thousands of vertical feet (both up and down) I was impressed by the comfort of the pack, especially the comfort of the heavily-padded hip belt and shoulder straps. Not once did I experience any chaffing or discomfort from any part of the pack. The pack has plenty of room for any/all gear required for the Western hunter. Although, there is really only one main gear compartment, which does make it difficult to organize gear, the pack has a couple of locations with PALS webbing for additional organizational attachments. I was able to carry and access my Swarovski 15 x 56 binoculars, Manfrotto tripod (attached via the multi-weapon carry system), knives, food, water, etc., without much problem. When the work began, I was glad to have a pack with an aluminum frame; it just offers more stability and places to tie down a heavy load. My son and I traded off packing out four deer quarters on the pack at one time (in addition to my existing hunting gear). We had to descend 1,200 feet in elevation, and in spite of the fact that we did not tie down the load well, the pack did its job well. On the late season elk hunt, I took the detachable pack off of the frame and used just the pack frame, while another individual carried the pack with my gear. I tied on two front elk quarters, and made my way to the truck, which was one-mile away, uphill. Again, the load on the aluminum frame stayed in place using just the existing carry straps, with the quarters resting on the support shelf. 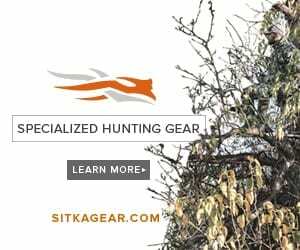 If you are looking for a new pack for your western hunt in rugged and remote country, I definitely encourage you to take a look at Slumberjack’s, Rail Hauler 2500. For more info, visit http://www.slumberjack.com/p-630-rail-hauler-2500.aspx?category=backpacks.